57 Episodes - Total Playtime Approx. 25 hours. Approx. 26 min. each Episode, a 30 min. show after the station added their commercials and News. Total Playtime Approx. 25 hours. 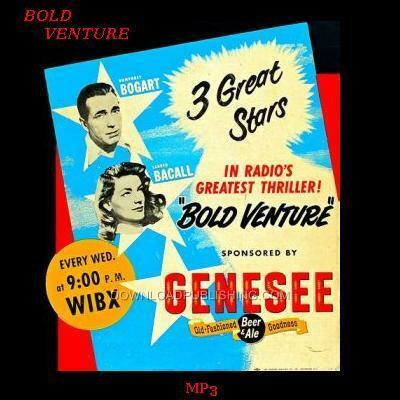 Bold Venture, a Syndicated Mystery, Adventure Radio Series which stars Humphrey Bogart and Lauren Bacall. It originally aired in 1951-52. Set in Cuba and the Caribbean, Slate Shannon (Humphrey Bogart), owns and operates a Hotel and Boat for hire. Lauren Bacall Plays his ward and Sidekick, Sailor Duval. His Hotel is a haven for Treasure Hunters, Revolutionaries and other Shady Characters. They sail into Mystery, Adventure, Intrigue and Romance on his Boat "Bold Venture" while cruising the Waters of Cuba and the mysterious Caribbean Islands.